Each year, Americans make nearly a million doctor visits for eye infections, resulting in $175 million in direct health care costs, the Centers for Disease Control and Prevention has estimated in the first study of its kind. 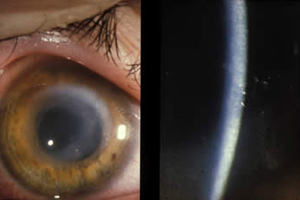 Keratitis, an infection of the cornea, causes pain and inflammation and can lead to blindness in severe cases. Wearing contact lenses is the largest single risk factor for developing the infection. CDC analyzed national databases of outpatient care centers and emergency rooms to develop the first national estimates of how much keratitis occurs in the United States. CDC experts found that Americans made an estimated 930,000 visits to doctor’s offices and outpatient clinics and 58,000 emergency room visits annually due to eye infections. Women were slightly more likely to be affected than men, accounting for 63 percent of office visits and about 55 percent of emergency room visits. The condition was spread relatively evenly across age groups. The report was published November 13 in CDC’s Morbidity and Mortality Weekly Report. Keratitis occurs when germs invade the cornea, the clear dome that covers the colored part of the eye. The infection is most likely to occur when contact lenses are worn too long or are not cared for correctly. Wearing contact lenses overnight, not cleaning and replacing storage cases frequently and exposing contact lenses to water are some of the key behaviors that increased the risk for keratitis. Epidemiologist Jennifer Cope, M.D., M.P.H. November 17 through 21, 2014, marks the first annual Contact Lens Health Week. To celebrate the week, CDC has developed a campaign to promote eye health, in collaboration with doctors, public health, eye care industry, and regulatory partners. By focusing on the best ways to wear and care for contact lenses, CDC hopes to help reduce the risk of eye infections and complications associated with poor contact lens hygiene in the estimated 38 million Americans who wear contact lenses. When patients seek care quickly, most complications of keratitis can be easily treated by an eye doctor. More serious infections can cause pain and lead to vision loss, depending on what germs caused the infection and how long the patient waits to go to the doctor. Carry a backup pair of glasses in case contact lenses have to be taken out. For more information on preventing eye infections and proper contact lens wear, please visit: www.cdc.gov/contactlenses.